Cast your mind back. England unlucky against Italy, so all is well as we get fired up to slaughter the much unfancied Uruguay in World Cup 2014. The Cooktwit has plotted an intricate web of beer, food and mayhem on the way to any Manchester hostelry that possesses a big telly. However, there is an hour to kill. Planets have aligned and so it is an unusual troupe that joind the Cooktwit on this merry stroll. Little bruv and his learned fledglings join the fray. Sophistication is not top of the list. Cheap, quick, hip and happening is where we need to be. Turtle Bay in Manchester homes into view. What do you think of here? A quick nod and were in. 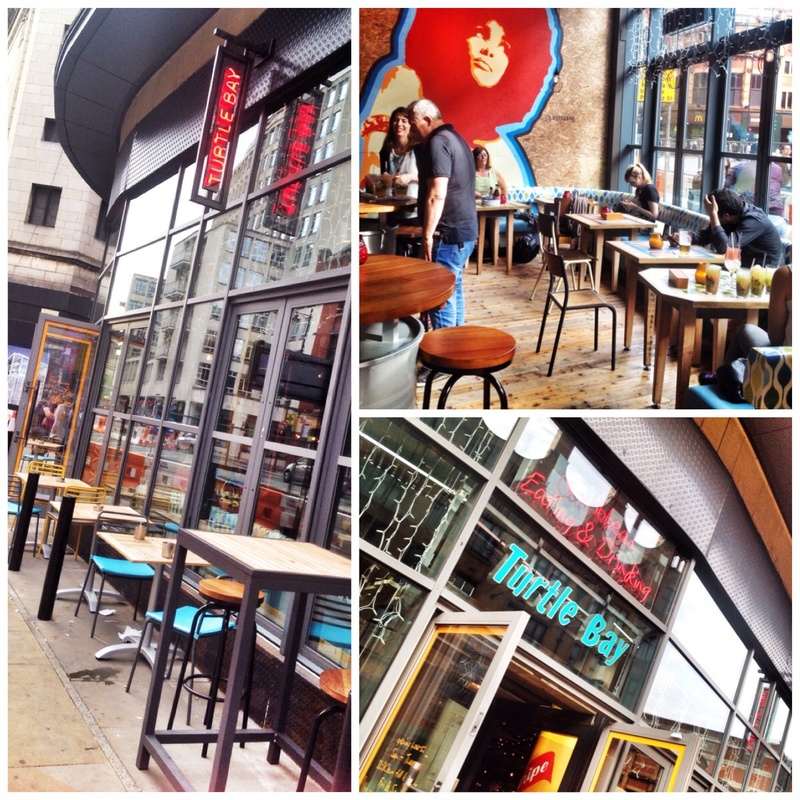 Turtle Bay is a Caribbean experience that has recently set up shop on Oxford Road next to The Paramount Wetherspoons. Not the most glamorous part of town. And given the chaotic roadworks that blight that part of town it didn’t look too inviting from the outside. But fair play to ’em it’s great inside. 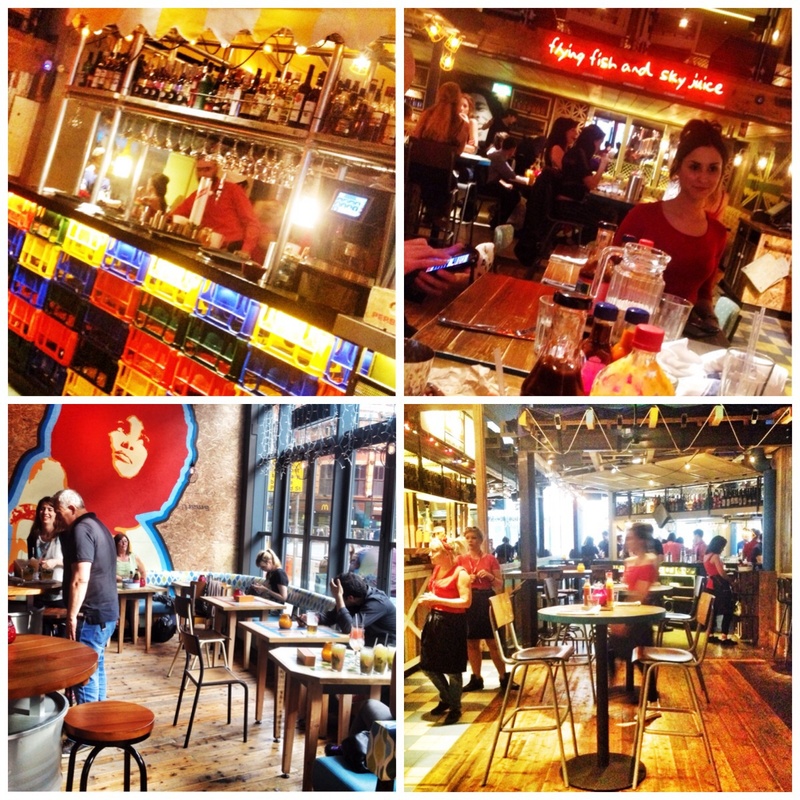 A mixture of high and low tables, booths, shacks, coloured crates and hip graphics combine with a groovy soundtrack, neon signs and metallic chic. It really is a jolly place to enter. The spirits were on the up. England couldn’t fail after this. Holly our bespectacled, pink hostess took us to our high table for four and explained how the whole chebang operates, Chelsea took over when the the action really started. We quickly racked up some sickly sweet cocktails which were half price until 7pm. The youngsters, despite the funny hat and wearing an England shirt, declared the opening events to be most encouraging. The only gripe was that there was no telly so we could carry on watching the match from here! 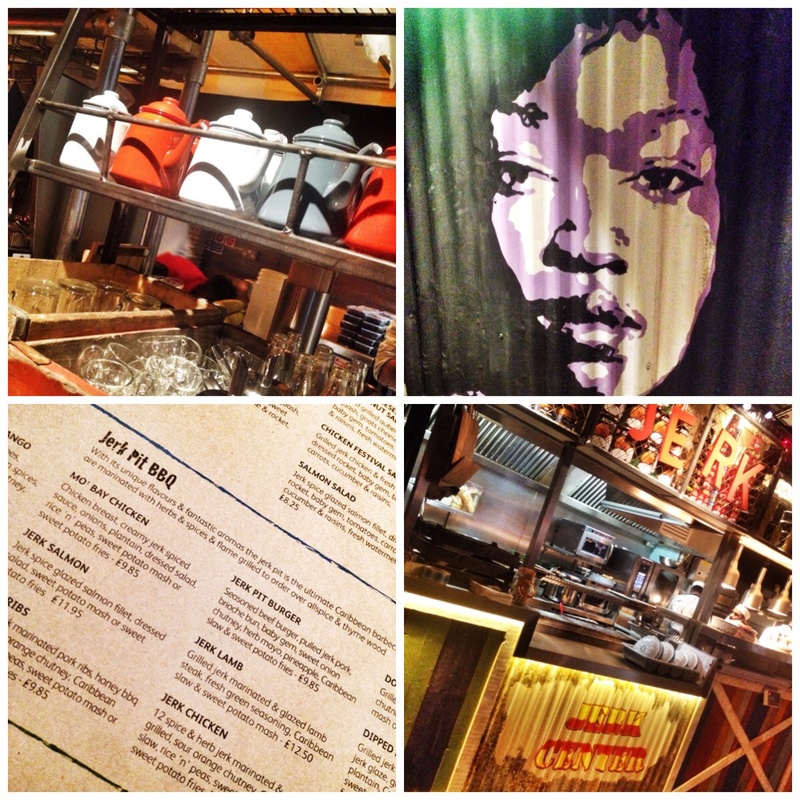 It’s a great menu, lots of different intriguing dishes. 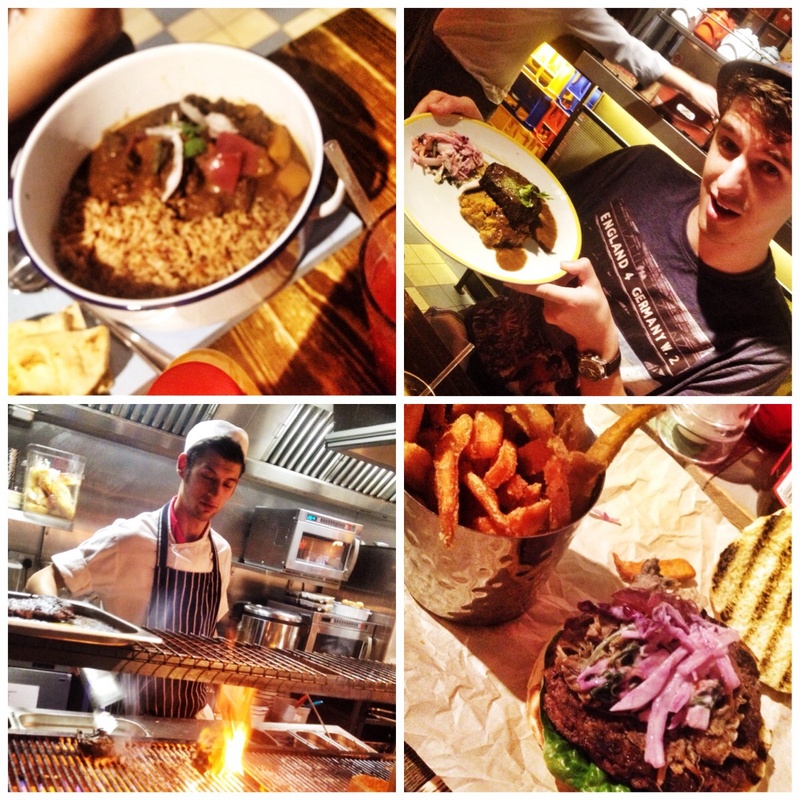 Subtitled Cutters, Lunch N Light, One Pots & Jerk Pit BBQ there’s something for everyone. I settled on a burger from the jerk pit section. You can watch the jerk pit in action, flames licking round the slabs of meat. The ‘Jerk Pit burger’ which means it came (as well as all the other standard accoutrements) with a slap of jerk pulled pork. It was accompanied with some slow and sweet potato fries all for £9.85. If I’m honest it wasn’t the best burger I’ve had. A bit too much fire had licked its flanks for me, me preferring a moist pink bit in the middle a la Gorilla, Solita and others I’ve had in the town. It had a great charred, BBQ taste though and the pulled pork gave it a nice kick. The fries hadn’t seen a frier for quite some time though as they were cold. Others in the posse had the goat curry and the fish curry. These both came in a big white metal dish with a lid. Nice touch really, gave it a bit of drama. Sadly I didn’t get a taste of them as they wolfed it down without a murmur. All gave it the thumbs up though. Looked a good portion, plenty of goat in the goatie effort and some decent squid knocking about in the fishy one. Given that the main reason for being out was the football with a few scoops I didn’t get chance to sample a desert. Will give em a go next time. All in all a pretty decent effort for a ‘chainy’ type restaurant. Apparently there is a few more Turtle Bays down South and one in Nottingham. I think I’d give some more of the ‘jerky’ stuff a try, probably the chicken. I’d recommend a try with a few mates after work, just the job. As you know England lost again 2-1, Suarez biting two goals. Some good beer in the Lass ‘o’ Gourrie though, so it wasn’t all bad!